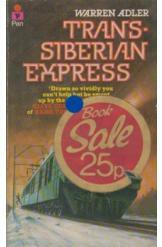 Trans Siberian Express Warren Adler Sci Fi. Book is in good condition, all pages intact. An eclectic group of Soviet agents, refugees, and academics ride the trans-Siberian railroad eastward. Hidden among them, a KGB agent with a grisly mission prepares to strike.